You have no doubt heard the expression “don’t sweat it”. But for the millions of people who suffer from Excessive Sweating a real medical condition also known as Hyperhidrosis, that is a little easier said then done. Hyperhidrosis or excessive sweating can effect any body part normally associated with sweat glands. People can experience excessive sweating from the underarms of course, but common areas also include the palms of the hand and soles of the feet. The condition of Hyperhidrosis is characterized by an inordinate amount of sweating not related to intense physical activity. There may be a genetic aspect to certain manifestations of the condition, as it does seem to run in families. The first onset of excessive sweating usually is seen in adolescence, but it has been known to appear in children, and even in some infants. While there is nothing life threatening about excessive sweating, it certainly impacts the quality of life of those afflicted with Hyperhidrosis. 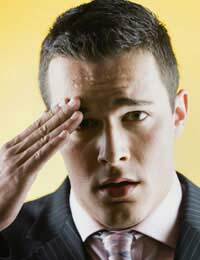 Work and other social situations unquestionably can become uncomfortable and embarrassing for the person suffering with excessive sweating. It is hard to pinpoint an exact cause of excessive sweating. Sweat is secreted by 2 million sweat glands throughout the body. Excessive sweating just like normal sweating is a response to certain stimulus. There are different stimuli that cause our bodies to produce sweat. The specific cause for a given individual’s Hyperhidrosis depends upon which of the various stimuli the excessive sweating is a response to. A person suffering from Hyperhidrosis may experience only normal sweat production from some stimuli, and excessive sweating from others. Technically “excessive sweating” is defined as more than 20 milligrams of sweat per palm per minute. But to be sure any unusual amount of sweating that makes you feel uncomfortable or embarrassed, under what most people would consider regular or normal conditions, qualifies as “excessive”. If you feel you are sweating excessively the good news is that you do not have to remain a social outcast or avoid potentially embarrassing situations. There are many treatment options available, regardless of the root cause of the condition. However it is strongly recommended that you seek the advice of your physician to rule out any underlying medical conditions that could be responsible for the excessive sweating. Menopause, being significantly overweight, certain neurological disorders or thyroid conditions can lead to excessive sweating. Excessive sweating is also a known side effect of certain medications. Next, you need to determine if the excessive sweating is localized, that is in a specific area of your body, or generalized, or all over the body. Most localized Hyperhidrosis is in the underarms, palms, or soles of the feet. Almost half of those with primary Hyperhidrosis (not caused by an underlying condition) sweat excessively from the underarms. Treatment OptionsIf like the majority of those with Hyperhidrosis your excessive sweating is generalized to the underarms, while it may seem obvious using a very strong antiperspirant may be the only treatment you need. Look for one that has as its active ingredient an Aluminum salt, such as aluminum chloride hexahydrate. Studies have shown that aluminum salts effectively block the ducts leading from the sweat glands to the skins surface. The draw back is that sweat is still produced and where it backs up behind the ducts, a heat rash, prickly heat or other skin irritation can occur. Iontophoresis – This is a treatment that uses electricity applied in such a way as to in effect “turn off” the sweat glands. BOTOX® (botulinum toxin) –Has recently been approved as a treatment for underarm Hyperhidrosis. In this treatment BOTOX® is injected just under the skin to block the release of acetylcholine, which activates the sweat glands. A special starch / iodine test is often performed to first identify the area of maximum sweat gland activity. BOTOX® injections for Hyperhidrosis usually last about 6 months, after which re-treatments are necessary. In the United States the treatment is covered by most private health insurance plans. During the treatment, local anesthetic is used to minimize the sensation of the injections. Surgery – In the past surgery has been a treatment option for excessive sweating but as more non-invasive techniques such as BOTOX® and Iontophoresis have come into fashion, surgical intervention has been used far less. Surgical techniques that are still used to treat excessive sweating include: removing the excessively sweaty skin of the underarm, or endoscopic thoracic sympahectomy –a technique of removing the sweat nerves near the spine in the upper chest. When it comes to excessive sweating the main thing to understand is that while it certainly can be an embarrassing condition, you are not alone, and there are many treatment options available for you.